There are Christ followers from all races, backgrounds and walks of life. When we come to know the love of our Savior we all come carrying different sins, burdens, and past experiences. This is why Christians can be so different in their perspectives on some things. Some people come to faith after being raised in Christian homes, yet others come to Christ from total absence of any religious background. We have Christian’s who grew up poor and had families that struggled financially but others had a two parent family and had a fairly good up bringing. The beauty of it is Christ does not discriminate and judge any of us by social status, IQ or family background. When we get saved and come to know the love of God we all however do bring the same thing, our sin and need for Jesus Christ and God’s love. We do have the bond of the blood of Christ that holds all true Christians together though despite our differences. We need not divide but whomever we may be and whatever our circumstances are we are called to love our brothers and sisters in the faith. John 13:34-35 “A new command I give you: Love one another. As I have loved you, so you must love one another. By this everyone will know that you are my disciples, if you love one another.” – Jesus. So the Christian who has been blessed with much has a golden opportunity to share with the brother or sister who has little. Also the one who may not have much in the means of financial success is still loved by God as well and through God’s Spirit living in them can still be rich. We all have spiritual gifts to build up the Church, the fellow believers and family of faith. In Christ Jesus we will not lack any resource or bit of strength we need to do God’s will and serve his family. Philippians 4:10-20 I rejoiced greatly in the Lord that at last you renewed your concern for me. Indeed, you were concerned, but you had no opportunity to show it. I am not saying this because I am in need, for I have learned to be content whatever the circumstances. I know what it is to be in need, and I know what it is to have plenty. I have learned the secret of being content in any and every situation, whether well fed or hungry, whether living in plenty or in want. I can do all this through him who gives me strength. Yet it was good of you to share in my troubles. Moreover, as you Philippians know, in the early days of your acquaintance with the gospel, when I set out from Macedonia, not one church shared with me in the matter of giving and receiving, except you only; for even when I was in Thessalonica, you sent me aid more than once when I was in need. Not that I desire your gifts; what I desire is that more be credited to your account. I have received full payment and have more than enough. I am amply supplied, now that I have received from Epaphroditus the gifts you sent. They are a fragrant offering, an acceptable sacrifice, pleasing to God. And my God will meet all your needs according to the riches of his glory in Christ Jesus. To our God and Father be glory for ever and ever. Amen. God has blessed us all to be a blessing. Praise the Lord for this since he has given us all something to use to enhance the lives of others who are in need and by doing so the World that is seeking answers may find the same joy, the same love, and the same faith that we have and burn with zeal for! 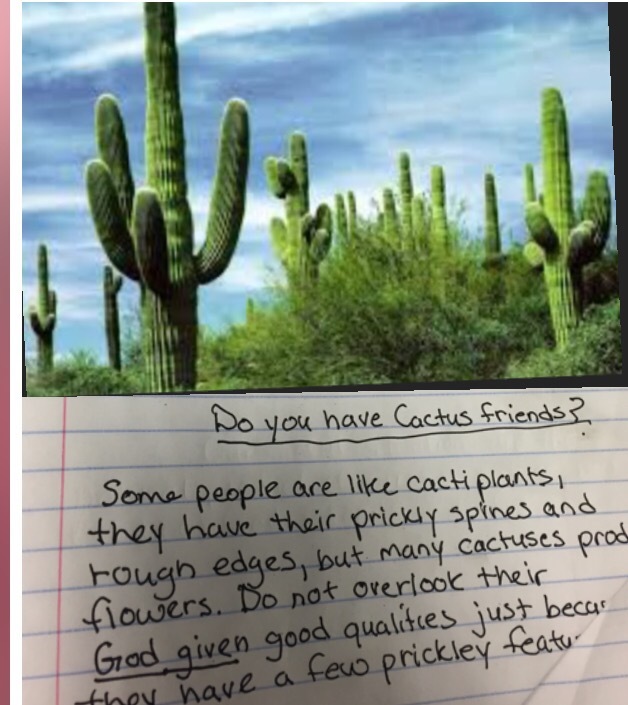 Some people are like cactus plants, they have their prickly spines and rough edges, but many cactuses produce flowers too. Do not overlook someone’s GOD given good qualities just because they have a few prickly features. Black, White, Rich, Poor, Male and Female. It’s not about being white or black, we are American’s and all of our lives matters.From conception to death! All lives matter to God. And to all of us who know the Lord, we are God’s children and I see way to often people segregate themselves from other believers who are different. We should not! God is a God of peace not divisions, true love bears the burdens of another. Christ has called us to love eachother and bear one another’s burdens! And it is not politicians or the government that is going to accomplish this, it will be Christ inside of us. Christians can at times see things differently and God has burdened each one of our hearts with different things. Scripture should always be the finale authority on any given issue for a Christian but sometimes we won’t always see eye to eye on certain things. Certain issues are black and white, but others are somewhat more difficult to discern. We should not let this divide us though and as we all know, political opinions can sometimes do a great deal of dividing. How on earth can we influence the world if we cannot even be at peace with one another? What example does this send to a lost world seeking answers? 38 but Paul did not think it wise to take him, because he had deserted them in Pamphylia and had not continued with them in the work. 39 They had such a sharp disagreement that they parted company. Barnabas took Mark and sailed for Cyprus, 40 but Paul chose Silas and left, commended by the brothers to the grace of the Lord. 41 He went through Syria and Cilicia, strengthening the churches. Romans 125 so in Christ we who are many form one body, and each member belongs to all the others. 6 We have different gifts, according to the grace given us. If a man’s gift is prophesying, let him use it in proportion to his faith. 7 If it is serving, let him serve; if it is teaching, let him teach; 8 if it is encouraging, let him encourage; if it is contributing to the needs of others, let him give generously; if it is leadership, let him govern diligently; if it is showing mercy, let him do it cheerfully. Now we are all called to serve and contribute to the needs of others and show mercy as well, but some Christians are especially gifted in certain capacities. Some are great teachers and can expound upon and bring out the rich meaning of scripture, some Christians are great and saying uplifting and edifying words of encouragement, others are blessed with material goods and find great joy in giving and yet others make excellent leaders! The point is not all believers are the same, but they are loved the same and bought with the same blood of Jesus that we all were. Galatians 6:1 Brothers, if someone is caught in a sin, you who are spiritual should restore him gently. But watch yourself, or you also may be tempted. 2 Carry each other’s burdens, and in this way you will fulfill the law of Christ. 3 If anyone thinks he is something when he is nothing, he deceives himself. 4 Each one should test his own actions. Then he can take pride in himself, without comparing himself to somebody else, 5 for each one should carry his own load. We must be careful as Christians not to try to help others with an attitude of superiority but rather love and gentle compassion. It is never a wise idea, or most of the time, to confront another’s sin while you are angry. Unfortunately, I’m a class example of how this does not work to well. We need to go into a situation 1.) in genuine concern for the person, not with a “holier than thou” attitude and 2.) Make sure we are not guilty of the same thing we are trying to correct them on! God set us free from sin so we can serve him as Lord, but not just that, but also so we can lead other’s to his freedom. “biting and devouring” wow! Striking analogy for how we can tear one another apart in angry disputes. Sometimes we do not like the way another Christian thinks or acts or their opinions, and if it is sin, Lord willing, we should address that issue but if they don’t want to hear it then we must remember that we won’t be the final judge of any person, and God will evaluate us also. This should keep us from getting too self righteous or arrogant but rather cause a healthy amount of fear. Romans 14:12-19 So then, each of us will give an account of himself to God. 13 Therefore let us stop passing judgment on one another. Instead, make up your mind not to put any stumbling block or obstacle in your brother’s way.14 As one who is in the Lord Jesus, I am fully convinced that no food is unclean in itself. But if anyone regards something as unclean, then for him it is unclean. 15 If your brother is distressed because of what you eat, you are no longer acting in love. Do not by your eating destroy your brother for whom Christ died. 16 Do not allow what you consider good to be spoken of as evil. 18because anyone who serves Christ in this way is pleasing to God and approved by men. Can you see how easy it is to have a slightly different take on a situation. At the end of the day, it is God who judges and weighs a persons heart. We cannot, it is impossible for us to because as people we can only weigh and evaluate what a person does. We can call out sinful choices if their is that manifested but only God can really see what is in an individuals heart. How often do we find ourselves either comparing ourselves to other or criticizing someones way of serving God or sharing Christ? How often do we consider our ministry methods better than another believers? Ultimately God is the final judge on the person. He knows the heart of why someone does thing or the motives there of! In Mark 9 we have several things going on that seem entirely unrelated from first glance. Jesus ends up in verse 50 tying it all together. They came to Capernaum. When he was in the house, he asked them, ‘What were you arguing about on the road?’ But they kept quiet because on the way they had argued about who was the greatest. The first situation was with the outside world the second was with themselves, if we continue to read we find a third incidence happens when the disciples try to stop someone who is not a part of their group. We as believers can find ourselves also doing the same things, arguing with non believers instead of sharing the gospel, arguing among ourselves in our congregations, or attacking other believers in other churches. We should always seek to be unified and spread the good news instead of quarreling! Biblical peace can mean two similar yer different things depending on the context. Peace can mean the internal well being even when all else is falling in or apart all around us, because we trust God. But peace also can suggest that we as believers are coming together and living harmoniously with one another, it says here we are members of “one body” That is Christ’s body. We may not always see things the same way but we need to have the same goal in mind to become as a whole fully conformed to the image of Christ! 1 Corinthians 1:10-13 I appeal to you, brothers and sisters, in the name of our Lord Jesus Christ, that all of you agree with one another in what you say and that there be no divisions among you, but that you be perfectly united in mind and thought. My brothers and sisters, some from Chloe’s household have informed me that there are quarrels among you. What I mean is this: one of you says, ‘I follow Paul’; another, ‘I follow Apollos’; another, ‘I follow Cephas’; still another, ‘I follow Christ.’ Is Christ divided? Was Paul crucified for you? Were you baptized in the name of Paul? As Christians we are called to be united and although we all have different views and personality differences but we should not divide over them. We are called to “keep the bond of peace” according to Ephesians 3:4 and some of the issues we end up debating and disagreeing on are very fruitless in building the Church up or impacting the lost world around us! Some churches fight over worship style, preaching format, the issue of whether or not a believer should or should not be allowed to speak in tongues, we see pastors even go ad far as criticizing other pastors. We see believers getting upset and angry with other believers over silly things. An example of this could be whether or not its permissible to have an alcoholic beverage in moderation every now and then. Some are convinced Alcohol is pure sinful and others don’t view it as sin unless it leads to drunkenness. There are many things like this. We know as believers certain things are black and white right and wrong but Romans 14:1-23 gives us some guidelines to follow in the grey areas that are not in clear violation of God’s Word. The basic principle is if what you feel is acceptable in your walk with Christ ends up hindering another believers growth than its better not to do it. 1 Corinthians 1:12-13 What I mean is this: one of you says, ‘I follow Paul’; another, ‘I follow Apollos’; another, ‘I follow Cephas’; still another, ‘I follow Christ.’ Is Christ divided? Was Paul crucified for you? Were you baptised in the name of Paul? 1) Glorify God by obeying and loving Christ and each other! 2) Taking the gospel locally and worldwide!